Carpet removal on industrial and commercial floors is a preparation method for removing existing carpet or carpet tiles and adhesive. In many commercial and industrial properties, or when converting office space to production or distribution use for new commercial, industrial tenants, carpet removal may be part of the demolition and preparation process for a new polished concrete floor, or other coating or topping. properties, industrial properties, new buildouts, or when converting office space to production or distribution use. Industrial and commercial floor preparation, carpet removal combines, Concare's skilled technicians to remove broadloom carpet as well as carpet squares, and the adhesive residue on the concrete floor. 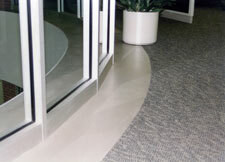 Since many industrial and commercial carpet adhesives have strong bonding capabilities, the carpet removal needs to be precise so that the concrete floor remains intact. Concare maintains the expertise to perform the process with accuracy and efficiency preparing the concrete surface for its new use, or new concrete floor finish. To learn more about our specialized carpet removal process for a clean concrete floor finish, contact us today.